Hat circumference 17 (19, 21) inches [43 (48, 53) cm] to fit head sizes 18 (20, 22) inches [46 (51, 56) cm]. The lines that form the design on the spindle whorl that inspired this hat were cut into the clay and emphasize the rotation of the whorl. The lines also remind me of a musical score, and thus the name has a double meaning. 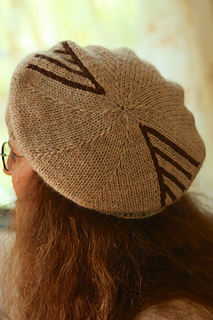 While there are two colors, the hat is knit in a solid color, with purl stitches where the contrast color will be filled in later. 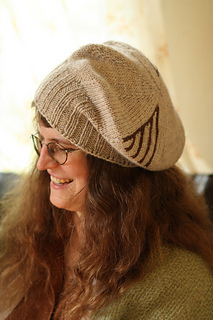 When the hat is done, either use a crochet hook to fill in the color with chain stitch or embroider the chain stitch, in either case using the existing stitches as a guide. If following pattern exactly, 16 stitches and 24 rows over 4 inches [10cm] in stockinette, worked in the round on larger needles. A recipe is provided for yarn with a different gauge. Color A: 115 (125, 130) yards [106 (115, 119) m] of worsted weight yarn; I used Paton’s Classic Wool, a 3-ply yarn that measures 12 wpi, pulled tight. If spinning yarn for the gauge given, make sure to spin sample yarn, knit a swatch, and wash it for the most accurate results. Color B: 5 yards 5m worsted weight yarn; I used a leftover piece of mystery yarn. This would be a great use for short lengths of favorite yarn. Instructions are not provided for these needed techniques: knitting in the round, purling, increasing, decreasing, stretchy bind off. Thanks to technical editor Steph Boardman, photographer Kathryn Walbert, and my wonderful test knitters!